“Tres Caballeros” Cover Art & Track Listing Revealed – Plus Updated North American Tour Dates! 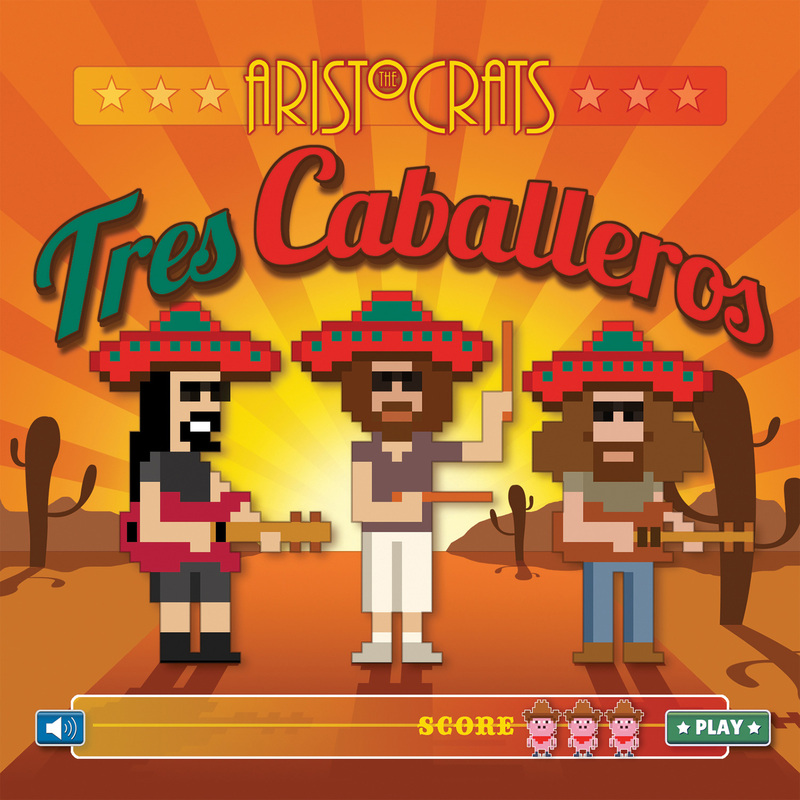 I’ve been admittedly quiet lately because, since mid-February, I’ve been working nonstop on the new Aristocrats’ album Tres Caballeros…which is now finally done! Hallelujah! This also means I’m fairly spent, so I’m going to be lazy (I know, so lazy, that’s me) and just use The Aristocrats’ e-mail voice as the official BellerBytes update for now. I hope you’ll forgive me. I’ll be back to myself soon, after a few days off in the mountains. The album is off getting manufactured right now! It’s due for an early summer release (exact date TBA). The album will be released in a Standard Edition (CD) and Deluxe Edition (CD/DVD), which will include a 30-minute documentary featuring live and in-studio footage, outtakes, demos, and more. The “8-bit” artwork represents a new spin on our tradition of animated covers, and was created by Tom Colbie, who designed the cover art for the band’s previous two releases, Culture Clash and Culture Clash Live. Tres Caballeros was tracked over ten days in February at world-famous Sunset Sound studios, where Van Halen (1), Led Zeppelin IV, and Rage Against The Machine’s The Battle Of Los Angeles were tracked, among hundreds of others. The result: Nine new compositions of greater sonic depth and breadth than ever before, with unique textures and lush layering augmenting the usual trio firepower. As always, you can go to the Aristocrats’ website TOURS page and find complete ticket links for each show. We’ll have more news in a couple of weeks: Preview videos and audio, the official release date, and more.